Regarding the Neighborhood Watch, Yula Ayers had a really great idea to get us started. If you would like to be involved in the Neighborhood Watch program in our neighborhood, it would be helpful if you would share your cell phone number with your neighbors. Initially, please email me with your permission, phone and cell phone number. If you prefer that a neighbor just call the police, without notifying you....please indicate that in the email. If you prefer to be notified, but by regular phone and by leaving a message, only if you are not home, that would be an option as well. 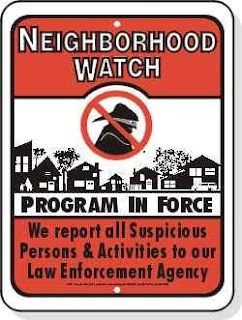 I will keep track of those who want to be involved and their contact information and then distribute to neighbors who have chosen to be part of the Neighborhood Watch. We hope to learn more about how we can protect ourselves and each other by inviting the Chief of Police to one of our quarterly meetings....or even have a special meeting just to discuss this issue. Being "in the program" means that you would like for your neighbors to pay attention to people coming and going on your property or you would like to be involved in the watch by volunteering to watch others property, acquire mail until a neighbor returns if requested, or possibly driving up to a house, but not entering so others can see that someone is around. Sometimes it is arguably almost impossible to tell if someone "belongs" on another neighbor's property. However, there are times, even with just a gut feeling, that there are suspicious characters which may or may not become intruders, but who could and should be reported to you....the owner, and then the police, if required. We need to "make a pact" that we will use this cell phone number only when we feel it is absolutely necessary to report suspicious activity on someone elses property or in case of an emergency...like reporting a fire. It's also a good idea to tell your neighbors when you will be gone for long periods of time. Sometimes, when there is a snow, and you plan to be gone, it's good for someone to drive up your driveway to make tire tracks to your house. Leave a light and radio on with a timer. Lock your doors and windows. Observe other neighbor's homes when walking or driving by. Perhaps you would like to be part of the watch...by watching rather than "being watched". If the thought of someone looking out for your best interest, but possibly intruding on your privacy bothers you....then perhaps you would like to just watch out for others. If that is the case...please let me know that. I will not include your name, address or phone on the list, but I might contact you to see if you noticed anything suspicious should an unwanted event occur. So email away..and lets get going on this. We've had some more break-ins in the neighborhood recently. HFI has had copper stolen repeatedly over the course of the last year. We can be more effective in reducing crime if we are organized and watching out for each other. Carrie Winkel: cgw1018@sbcglobal.net, 339-3661 I will be listing my cell phone number on the distribution flyer of those who want to be part of the Neighborhood Watch. Check it out! We now have a direct link to our neighborhood blog, from the Neighborhood Association page. Thank you Vickie Provine...you rock!!! !